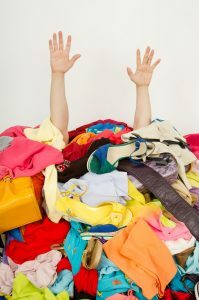 Let’s declutter your life, I said to Jan. She had chronic fatigue syndrome and food insensitivies, and her life was not moving at all. She was stuck like glue to inertia, lack of motivation and low morale. She was my feng shui client, and definitely the Queen of Clutter, with whole rooms in her house packed to overflowing with anything you can think of, as well as all her walls decorated with bits of paper, postcards, photos, telephone numbers and reminders. Even her cooker hob was a fall-out zone for bits of paper. Jan had many hobbies and interests, with hoards of subscriptions to her different interests. This involved hundreds of envelopes through the post-box containing endless leaflets, catalogues and whatever. She was almost buried under paper. Every clutter-clearing session began with Jan choosing an area to work on. This time she suggested the files next to her bed. I said ‘But Jan, we’ve done all your files and there was nothing next to your bed.’ She said ‘They were hidden from you because I couldn’t bear to deal with them.’ These files were to do with Jan’s divorce, her parents’ divorce, both parents’ deaths, and the deaths of several relatives that Jan had been looking after. Jan was clearly scared of re-visiting the pain and anguish she felt all those years ago. After several tear-filled hours of looking through every piece of paper, she finally reduced the files to a few certificates and bits of memorabilia. She relegated everything else to the incinerator at the bottom of her garden. A few months later, a whole new Jan greeted me at the door. She looked healthy and vibrant. She had taken a course in dowsing, which enabled her to identify the foods causing her problems. She was tackling her paper clutter herself and was almost free of her chronic fatigue. Many new and interesting things were going on in her life, from new friends to travel, from bell-ringing to bird-watching. You name it and Jan was doing it. Jan’s past-history papers had definitely been holding her back from getting her life moving again. It took all her courage to look through them, and it was heart-rending for both of us, but what a transformation in her and her life, and for me ­ a pleasure to see such contentment and enthusiasm in her.